Sponsorship | Geoconferences (WA) Inc.
Geoconferences may consider requests for sponsorship of events and activities that meet its objectives of promoting the understanding and teaching of geology in Western Australia, particularly the Precambrian and its mineral deposits. Geoscientists who have ideas to hold workshops, conferences or seminars involving pre-eminent presenters from interstate or overseas may apply to Geoconferences for assistance with travel and accommodation costs. To assist in evaluating your proposal, please provide information about your organisation and its history, and full details about the event or activity, the amount requested, how the sponsorship will be used, and how the sponsorship will help Geoconferences to meet its objectives. Geoconferences is a Platinum supporter of Earth Science Western Australia, which provides resources to enrich the teaching of earth and environmental sciences. In 2008, Geoconferences made a substantial contribution to the Hammond Nisbet Geoscience Fund through the UWA Geoscience Foundation to secure an ongoing position at the Centre for Exploration Targeting. From 1996 to 2007, Geoconferences was a Major Sponsor of the Australian Student Mineral Venture – West Region (ASMV), a two-week residential program presented by The Australasian Institute of Mining and Metallurgy to encourage more of Western Australia’s brightest high school students to consider professional careers in the mining industry. 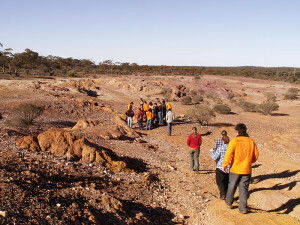 The ASMV was hosted by the MINWEST Consortium comprising The University of Western Australia, Murdoch University and Curtin University of Technology, including the WA School of Mines.